Manufacturer of a wide range of products which include agarbatti dryer and shrimp prawn fish seafood dryer. We are the leading supplier of Silkworm Cocoon, Agarbatti, Spices Dryer made from high quality material at competitive prices. This dryer is suitable for Silkworm Cocoon,Agarbatti,Spices drying. 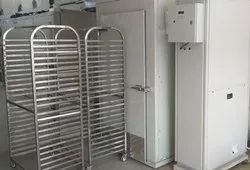 We are the leading supplier of new technology which called as Dehumidification drying also called as Heat pump drying for fish,Shrimp, Prawn, Dryermade from high quality material at competitive prices. This is very effective and energy efficient dryer. Our dryer consume 1/3rd electricity compare to electric tray dryer without any losses in structure ,aromatic values. this is low temperature drying i.e Below 65 Deg celcius ,Reletive humidity 10%.